The business demand for any particular language can ebb and flow but, perhaps not surprisingly, one that’s busier than ever is Arabic. After all, Arabic is the official language of 26 countries, the first language of nearly 300 million people and a second language of nearly 280 million more. Our studio often find themselves working away on several Arabic typesetting projects at any given time. Given this expertise, I’ve been reflecting on the broader history, my pick of professional Arabic fonts and how the field is developing. First, the present day. An interesting current trend is the design of Arabic fonts tailored to match an existing English typeface. 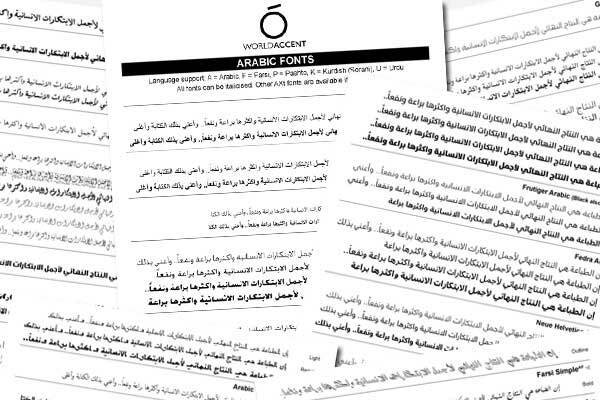 These create powerful fonts which can be used to set both Arabic and English in harmony. 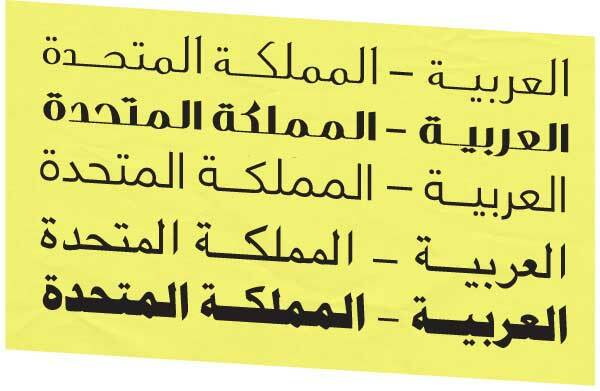 So, for instance, Lucas Fonts have developed “TheSans Arabic” as part of their Thesis project, or font “superfamily”. Meanwhile Linotype have developed one Arabic font around Neue Helvetica, and a second around Frutiger. These modern Arabic fonts follow the harsh geometries of their Roman equivalents. They have a corporate feel, and would make a great choice for signage. The fonts also include support for Farsi and Urdu (although Urdu only in the form of Naskh rather than the more reader friendly Nastaliq – a distinction I’ll elaborate on at another time). Of course, Linotype have also developed some excellent uniquely Arabic fonts, such as the Lotus, Badr and the ever-popular Yakout. I should add – before this starts sounding like an advert for Linotype – there are several great Arabic font designers and foundries working away. In fact, we are luckly enough to have hundreds of their creations. For those thinking about dipping their toes in the waters of Arabic design or DTP, it’s worth pointing out that these fonts will not work correctly in the English versions of InDesign or Quark out of the box. You need to gain access to the World Ready Composer, and be able to access some specific Arabic features. Adobe has licensed the creation of InDesign ME (Middle East), a special version to deal with the additional demands and complexities of Arabic typesetting, which is always recommended for large projects. This is one of the reasons why many designers chose to get someone else to do their Arabic typesetting, receiving back outlined Arabic text within Indesign. If that’s a glimpse of the future, what about the past? Those who are interested in the development of Arabic typefaces and calligraphy should definitely settle down to read the excellent article on ilovetypography.com, “Arabic calligraphy as a typographic exercise”. Although as the article points out in its introduction, “Arabic calligraphy” is a hybrid term more suited to English. The article outlines some of the considerable history behind Arabic styles of script such as Kufic, Naskh, Thuluth and Diwanii. Of these, Naskh is the most widely used style of Arabic script in newspapers, magazines, promotional materials and adverts while Thuluth remains important as an ornamental scripts, used for calligraphic titles and inscriptions. “Arabic letters are generally not written separately but joined to each other in groups or entire words, like a script typeface in English. And though the Arabic alphabet has only 28 letters, most letters have four forms, depending on whether they occur at the beginning of the word, in the middle of the word, at the end of the word, or stand alone. Of course, none of this background reading is strictly necessary but by understanding the history of Arabic typesetting I believe we can strive to make our work of today that bit better and more sympathetic. What’s more, I think it’s fascinating stuff and hope you enjoy it too! Thanks Jim. Your article’s prompted me to push my copy of Arabic Typography back up to the top of my reading list. Thanks for a great set of links. Have World Accent ever use Winsoft’s Tasmeem plugin software for InDesign for rendering Arabic calligraphic effects? I’d be really interested to read a review from you if you have. Great article! I’d like to share some Arabic typography resources, if I may. My name is Kelly Rigotti and I work for WinSoft International. We are the company that localizes Adobe products for the Middle East (as well as a range of other software, like FileMaker, for emerging markets). We also have our own products, one of which is called ScribeDOOR. You mentioned in your post that Arabic fonts do not work correctly with English versions of InDesign; ScribeDOOR allows you to use 21 different complex scripts (Arabic, Hebrew, Farsi, Greek, Urdu…) in regular versions of InDesign and Illustrator. It’s also much less expensive than the ME versions, and is best for people who have occasional need of those languages in their regular versions of ID & AI. If I may, here’s the link: http://www.winsoft-international.com/en/products/scribedoor-for-creative-suite.html. The Arabic version of Frutiger was designed by the extraordinary Nadine Chahine (her blog is here: http://www.arabictype.com/blog/ ). We love all her work and were lucky enough to have her as judge of the recent contest we ran, the WinSoft Arabic Typography Contest (https://www.winsoft-international.com/contest). The WATC, which finished in June, was around the theme of UNESCO’s theme for 2010, the Rapprochement of Cultures. We had 73 accepted submissions, all using Tasmeem and ME versions of InDesign. There were 10 winning pieces (2 of the winners are graphic designers living in England, Samar Maakaron and Soraya Syed) and we think that the designs are great representations of both the theme and modern Arabic typography. I seem to have gone a bit off topic here! Now I’m off to read the rest of your posts. @Chris Good question about Tasmeem. I’ve always wanted to have a play with that myself, as Arabic is incredibly adaptable for calligraphy and letter art, although I think you would need to be a first-language Arabic speaker. That said, everything I’ve ever read suggests it is a powerful piece of software, and would be great for a more “arty” project such as an Arabic poster advertising an art fair. People who are interested in the more artistic, calligraphic side of Arabic script might find Mohamed Zakariya’s website interesting. I forgot to mention it in the main article but there’s a great gallery as well as historical information. A very comprehensive article Jim, much appreciated. I would be very interested to read a detailed account about the latest developments in Urdu typesetting and font creation.